FREDERICTON â€” After years of decline, it looks like wild Atlantic salmon are making a comeback in the rivers of eastern North America. While scientists and anglers are tempering their enthusiasm until a clear trend is established, there’s no question this is a record summer for young salmon called grilse returning to home rivers after one year at sea. “People are talking about runs they haven’t seen for a decade or more,” says Gerald Chaput, a biologist with the federal Fisheries Department. On the storied salmon rivers of New Brunswick, heavy rains and high waters are providing perfect conditions for salmon. Atlantic salmon fly fishing conditions for the Miramichi at McNamee August 7th . As you can see from this photo our river at McNamee is still nearly 18inches above normal . The pools are starting to shape up a little and we have hopes of normal water levels by early next week . Both fish taken this week were bright and silver and full of fight . The high water pools are obviously the only ones being fished . Garrett , Anthony and I canoed the Cains River yesterday , beautiful canoeing water but is useless for fishing , still 15 inches above normal . 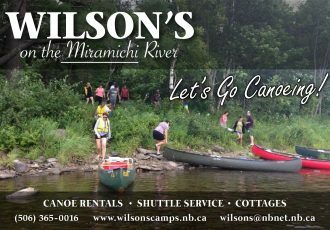 Wilson’s Miramichi River Report July 23rd. Atlantic Salmon Fly fishing conditions on the Miramcihi River at Wilson’s for July 23rd . I know some of you are going to think I am full of crap but I am pleased to report another perfect little raise of water . As of tonight the river is up app. 5 inches here in McNamee and under cloudy skies the temps are near perfect . We are having excellent fishing on some days with fresh fish moving through and other days it is about normal for late July fishing and when we get a really hot sunny day , which can be expected this time of year then the salmon retreat to the deep holding water and sulk . We have yet to get into the typical warm water period where bombers work best , when this does come around most of the guides think we are in for some fantastic dry fly fishing . Atlantic salmon fly fishing conditions at McNamee on the Miramichi River as of July 17th . The water height remains superb, compare todays picture with my June 30th and July 5th reports to see the difference . The warm weather is heating things up during the mid day resulting in slow evenings but we are hooking fish in most pools in the mornings . Bombers are working if you know the best technique . Presentation does make a difference at this time of the season, Doug Hill , whom I consider a “Fly fishing Pro” hooked three fish and rolled several more yesterday under tough conditions .